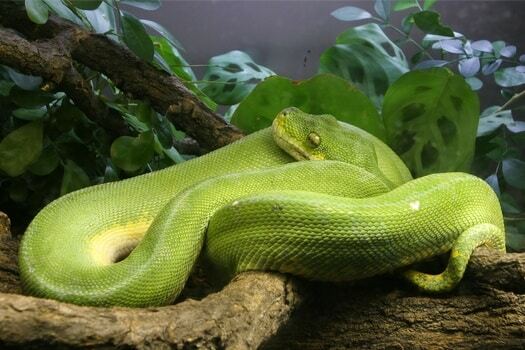 Green tree pythons are arboreal, non-venomous snakes that are native to Indonesia. They are ambush predators, spending most of their time wrapped around tree branches, waiting for a meal. Green tree pythons make good pets, and tend to eat well in captivity. What do green tree pythons eat? They eat rodents and, occasionally, small reptiles. Contrary to popular belief, they don’t eat birds. They’re arboreal predators, meaning they sit ready to ambush on a tree branch. In captivity, green tree pythons can survive on a diet of frozen-thawed mice. We’ll look at the sort of prey green tree pythons eat in the wild, and how they hunt for food. You’ll also find out how to feed a green tree python in captivity, and what food they like to eat. 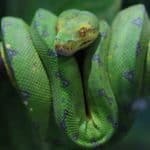 Finally, you’ll discover some tips on what to do if your green tree python is not eating. Green tree pythons sit on a low-hanging branch to wait in ambush for prey. It was long thought that green tree pythons eat birds, since they live in trees. But fieldwork examining the stomach contents of these snakes showed that they don’t. Instead, they’ll eat small prey items such as rodents and small reptiles. They’ll hang from a branch close to the ground, which is a behavior you’ll be familiar with if you own one. When they see a prey item move past, their neck will shoot out so that they can bite it. Keeping themselves coiled in this way, therefore, serves both to camouflage them against the branch, and help them hunt. When they first hatch, they almost exclusively feed on closed-litter rainbow skinks, also known as delicate skinks or garden skinks. These are small lizards common across Australia, New Zealand, and nearby islands. Cape York rats. These rats are related to common sewer rats, and look similar too. Cape York mosaic-tailed rats. These are a subspecies unique to just one part of Australia. Their diet can be recreated easily in captivity. 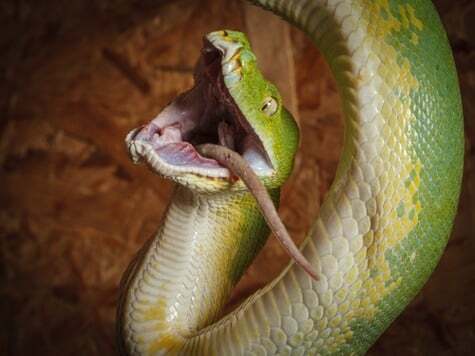 Green tree pythons eat a regular diet of pre-killed mice. You can buy these mice either online or from a pet store. The portion size and feeding frequency depend on the size of the snake. Smaller snakes eat smaller portions, but on a more regular basis. Larger adult snakes eat large portions, which may appear a little too big. But they eat these portions less frequently than juveniles. When your green tree python grows up, start them on a diet of larger rodents. Adult mice and eventually rats are a good source of everything they need to be healthy. Green tree pythons don’t need snacks. Snakes, in general, don’t need anything but their main meals. They get all of their nutritional needs from rodent prey. 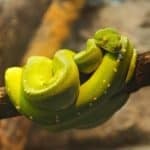 So, how often should you feed a green tree python? Here’s a chart that shows you what to feed them and when, from the time when they’re newly hatched until they’re adults. The above portion sizes and feeding frequency are estimates, and are intended to be a rough guide. You should base your snake’s feeding schedule on the snake itself. 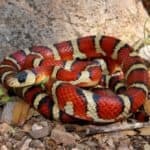 Is your snake overweight or underweight? The cross-section of a healthy snake is like an arch, round on the top and flat on the bottom. Fat snakes are round like circles, while underweight snakes have a prominent spine and inwardly-curved sides. 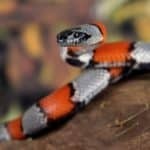 Does your snake frequently reject food when it’s offered? If they do, then this could be a sign that they’re not hungry yet. Try feeding them a day later. You’re feeding them the wrong kind of prey. Green tree pythons only need to eat rodents; no snacks or anything else. Your snake is sick. All sorts of health problems cause a lack of appetite. Mites, mouth rot, scale rot, and respiratory infections all prevent your pet from eating. Your snake isn’t hungry yet. You might be feeding them too soon after you last fed them. Feeding them snacks can make it less clear when their mealtimes should be. Your snake is shedding. When snakes shed, they don’t want to eat. Your snake is stressed out. Stress can be caused by too large or small an enclosure, excessive handling, or living with another snake. Stress makes them not want to eat. It’s mating season. Snakes mate in the spring, and during this time, will choose not to eat. They’ll eat after they breed, and put back on the weight that they lost. This is natural. If you can’t figure out why your snake isn’t eating, talk to a reptile vet. They’ll be able to help you get to the bottom of the problem. Do bear in mind that green tree pythons feed less than other snakes do. They’re ambush predators, which means that in the wild, they only feed infrequently. This means that their digestive systems have evolved to make the most of their meals. Like other snakes, they digest almost everything, the only exceptions being feathers and fur. By breaking down the bones they eat, they get even more nutritional value from each meal. All of this is to say that there may not be a problem with your green tree python after all. They may eat less frequently than you expected. Bear in mind that pre-killed prey can be either freshly killed or frozen. You’re free to buy frozen prey in bulk, and defrost it before you feed to them. But you could also keep or breed your own mice, kill them humanely, and feed your snake that way. If your green tree python isn’t eating, you could always try changing the kind of prey you offer them. It can take time for a juvenile snake to adjust to pre-killed prey, because that’s not what they eat in the wild. If they won’t eat, try freshly-killed prey. You should, however, avoid live prey. Live prey can hurt your snake. If the snake isn’t hungry, they’ll ignore the prey. The prey can then bite your snake. If you do feed them live prey, don’t leave them alone with it. Snakes are easy to feed if you know how. Here’s a brief overview of how to properly feed a green tree python. Only feed at the right time. Follow our chart above with regards to feeding frequency. You should also avoid trying to feed during shedding or when your snake is stressed. Feed your snake in a different container. By feeding your snake in their regular home, you encourage them to become cage aggressive. They associate their tank with food, which means that when you try and handle them, they’ll strike. Use tongs to feed them. Snakes strike in the blink of an eye. If you feed by hand, you could easily get caught by accident. Don’t touch their food when you’re preparing it. The snake will smell the smell of prey on your fingers. The last thing you want is to make them think your hand is a meal. Don’t handle them before or after they feed. You don’t want to associate handling with feeding, or it might try to feed on you. Handling after feeding can lead to regurgitation. If you follow these steps, but your snake still isn’t eating, then they likely have a health problem. Talk to a veterinarian and see if they can figure out what’s wrong. 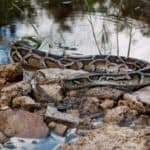 What Do Burmese Pythons Eat? 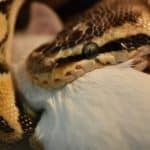 What Do Ball Pythons Like to Eat?